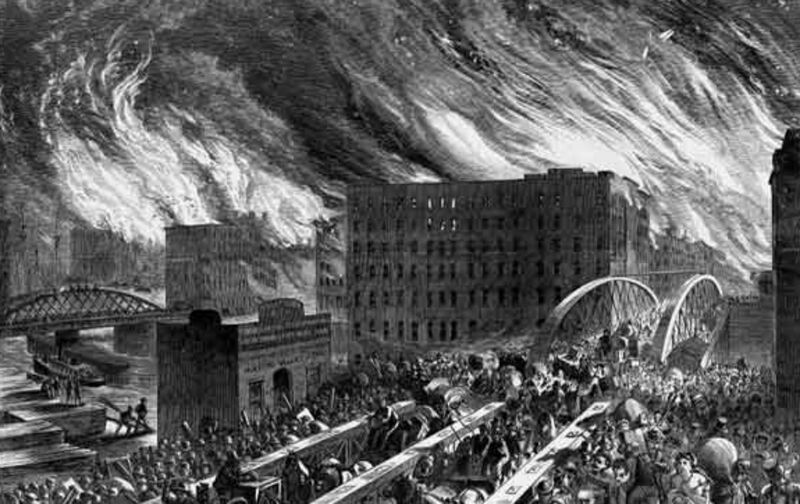 However the Great Chicago Fire started—the journalist who first implicated Mrs. O’Leary’s cow later admitted he made the whole thing up—it quickly became one of the major disaster of 19th-century America. The Nation’s founder and part-owner, landscape architect Frederick Law Olmsted, happened to be in the city pursuing some design opportunities when the fire occurred, and a few weeks later he wrote a dispatch for the magazine on the aftermath of the fire. His descriptions, in “Chicago in Distress,” of terror and heroism during the destruction of a major part of an American city carry echoes of more recent urban holocausts. Burning fragments of wooden parapets, sheets of roofing metal, signs, and scuttle-doors were carried great distances, and, with blazing felt, tarred paper, and canvas, and myriads of smaller sparks, sometimes swept down upon the fugitives with a terrific roar. Very sensible men have declared that they were fully impressed at such a time with the conviction that it was the burning of the world. Loose horses and cows, as well as people of all conditions on foot and in wagons, were hurrying half-blinded through the streets together, and it often happened that husbands and wives, parents and children, even mothers and infants, were forced apart and lost to each other. Sudden desolation thus added to the previous horrors, made some frantic who would otherwise have maintained composure. In general, however, the people, especially the households of the north side, appear to have manifested a greater degree of self-possession and of considerate thoughtfulness one for another, under these circumstances, than can be easily believed. Almost every one holds the remembrance of some instance of quiet heroism, often flavored with humor. The remains of only about one hundred human bodies have thus far been recognized in the ruins, and the coroner and others are of the opinion that not more than two hundred lives were lost. That the number should be so small can only be accounted for by the fact that there was an active volunteer rear-guard of cool-headed Christians, who often entered and searched houses to which they were strangers, dragging out their inmates sometimes by main force, and often when some, caught unawares, were bewildered, fainting, or suffocating. One still sees burned garments and singed beards. How the city is to recover from this blow no one can yet see, but the difficulty is engaging the study of its best and most conservative minds; and that in some way it will recover, and that it will presently advance even with greater rapidity, but with far firmer steps, than ever before, those most staggered and cast down by it have not a shadow of doubt.